Medium profile six panel soft structured cap. Heavy washed camouflage twill. Matching sandwich visor and eyelets. Fabric strap with two piece hook & loop closure. ..
Two-Tone Camo Golf Cap Embroidered with your Logo. 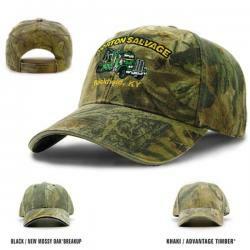 Medium profile size panel structured cap with camouflage twill. Non glare black under visor with black visor trim. Fabric strap with two piece hook & loop closure. ..